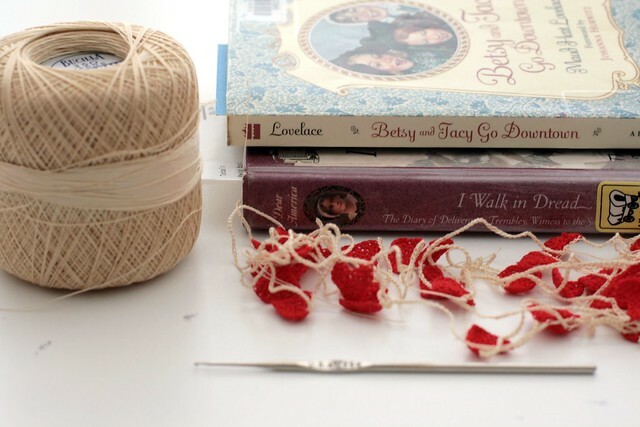 I'm joining Ginny's Yarn Along today, though really for me it's more of a Thread Along. I made the mistake of saying yarn instead of thread when I hit the jackpot in the craft section of the thrift store recently. A veteran crafter/thrifter called me on it - I won't make that mistake again! No, I probably will. I scored all this vintage thread for a quarter a piece. I'm in crochet heaven. I've got a nice little cottage industry going on right now. My little crochet heart garlands are keeping me in business! To think all I needed to turn a little profit was 75 cents in thread, an old crochet hook, and a well timed email to the staff of Design*Sponge. A good small business investment indeed! Anyone can make a pledge to help Shannon grow her business. Any amount helps. 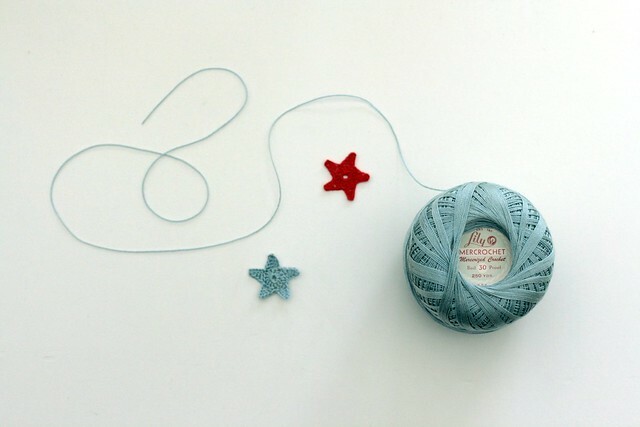 And just like pledge drives on PBS and NPR, pledgers receive perks (as in free yarn!). Help Shannon, help yourself. I really want to see Shannon reach her pledge goal, so I'm going to offer a little perk of my own. Pledge any amount towards Shannon's Kickstarter project, email me (mollydunham@sbcglobal.net), and I will enter your name in a drawing to receive a Mini Hearts Crochet Garland. 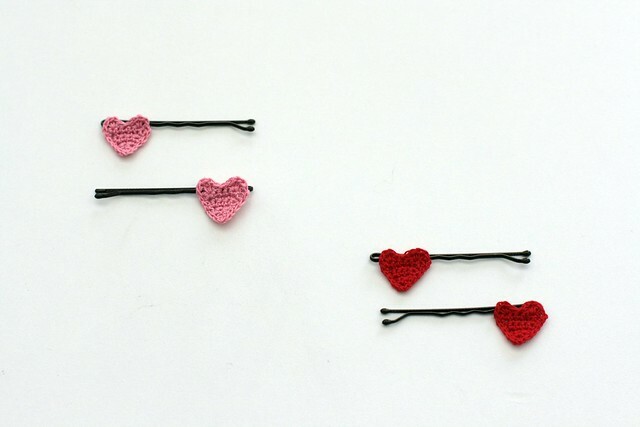 Mini Heart Hair Clips, in pink or red. I'm working on a new pattern which I should be ready to share by Friday. Shannon asked me if I had a crochet pattern for stars. I didn't, so I made one up. Ask and you shall receive! oh goodness, those stars might just put me over the top...my little guy's name is Orion, so go figure, I like me some stars. I love it all, and a quarter a piece...I would so do it again if I were you! those stars are AMAZING. you are amazing. what a gigantic score at the thrift!!! those colors are amazing. Betsy_Tacy! Send *they call me mommy* to my blog for the lowdown. 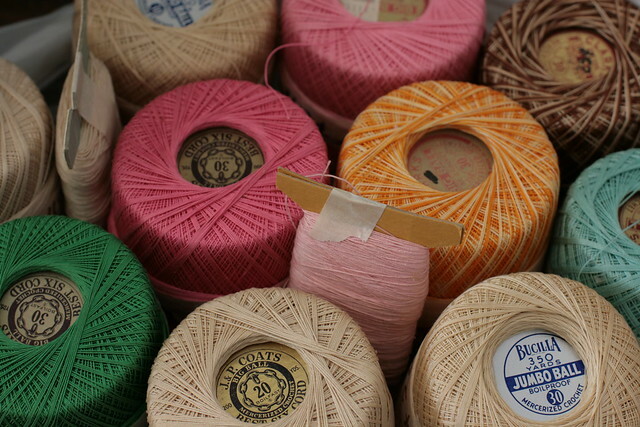 Ohmigoodness, thrift store craft supplies are one of my favorite things in the world. LOVE your pictures m'dear! Those stars are fabulous! Lucky score at the thrift store. All I ever find is WHITE. such lovely stuff! I really like your dear friend at the Spun Monkey however I can't help out...although I would LOVE her yarn! So DELISH!!! Oh wow, nice thread score. I forgot to mention that most of the spools I received are white or cream...but there are a precious few blue and purple...perfect star candidates! Now what to do with all the white...hmmmm...snowflakes??? And heart bobbypins = *love* !!! Thank you so much for sharing my project, Molly! Oh Molly. I am so glad you are making more garlands. I simply love mine. Even better in person. And those stars are adorable. So great to assist those small creative businesses. I love those cute hair pins! Love those little hearts and stars -- that is some tiny stitching! Love Betsy~Tacy, too! I do so love the thrift store. What an amazing find. And what an entrepreneurial spirit you have. And to think you weren't sure it would be worth your time. Fantastic! you've got good things happenin' lady. molly, i am loving the hearts! i've made a dozen and want to make more, more, more. i'm looking forward to the stars, too. lucky you with all of that thread! You deserved to find those threads at the thrift store. Can't wait to see those stars. I too, am keen to see the stars. love all that thread! i keep looking at it at the craft store but promised i wouldn't buy any until i reacquainted myself with my (less than stellar) crochet skills. congrats on your garlands taking off - they are truly adorable! So do we get a pattern for those! Those stars are too cute! Glad to hear your shop is doing well. I recently set up shop myself! Also, I don't think I've commented since you've been "back" and would like to tell you how glad I am to see your posts more often again! Your blog is one of my favorites. The hearts on the bobby pins absolutely ADORABLE !!!! I love it I have 4 girls and these would be awesome better than store bought. molly, so funny, I just wrote a post titled "just ask," with a link to Shannon's kickstarter. Isn't that a great idea? And you--you are just so kind to sweeten the pot with a giveaway. Of course you heart garlands are a hit. Seems anything you set out to do these days is a grand success! oh and the hair pins are adorable too.